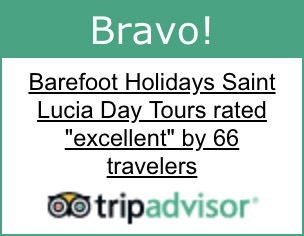 With exciting tours, Land and Sea experiences, there is always something exciting to do in Saint Lucia. Here is our List of Top things to do in Saint Lucia List! Located on the Southwestern coast of the island of Saint Lucia is one of the World’s renowned twin-peaks, ‘Gros Piton’ and ‘Piton Piton’, a World Heritage Site. Annually, hundreds of tourists arrive on island to explore the Pitons and hike to the top because of its history and that breath-taking view of Saint Lucia’s deep blue waters. Linked by the Piton Mitan ridge, the two volcanic plugs are famous tourist attractions for hikers and mountain climbers who wish to experience something unique. A Drive through Volcano? Yes! Saint Lucia is home to the Caribbean’s only drive-in-volcano. High above the town of Soufriere lays one of Saint Lucia’s most cherished World Historical Sites, the Sulphur Springs. Greeted with Hellish rotten-egg vapors, cauldrons of jet black water bubbling furiously, welcome to the town of Soufriere. Known for its healing properties, the Sulphur Springs is one of Saint Lucia’s daily most visited attraction sites and annually, this attraction is said to attract hundreds of visitors. . When it comes to ‘Going Deep blue’ in Saint Lucia, it’s all about lovely sandy beaches, long days of fishing, whale and dolphin watching, snorkeling and Scuba Diving and party cruises. One of the top things to do in Saint Lucia while on island is enjoying it’s lovely blue waters. Grab a rod and a few friends, enjoy a day of fishing with music, local rums, Saint Lucian-styled foods and discover the ocean. In the afternoon, enjoy a breath-taking snorkeling experience while exploring Saint Lucia’s underworld. When it’s time for resting, do it in style with a calm, bright orange sunset. Reminisce on your fun-filled day of Saint Lucia’s unique excursions with its natural beauty. For those who may not be a experienced fisher, it is never too late to welcome a new hobby. Saint Lucian cuisine is a unique experience with lots of flavors, many a grand-mothers secret. On island there are freshly grown seasonings and an unforeseen world of fruits and vegetables. This causes visitors to stray from the usual and go ‘Local’. With over 20 locally-inspired restaurants, Saint Lucia’s creole cuisine has been evolving for the past years. Saint Lucia is known for its great use of coconuts, peppers, bananas and mangoes, all of which are used in manufacturing products for shipment to its neighboring islands. Whether you are a lover of peppers, sweet-tooth individual or simply a Caribbean lover, the Saint Lucian cuisine has something to satisfy your taste buds. 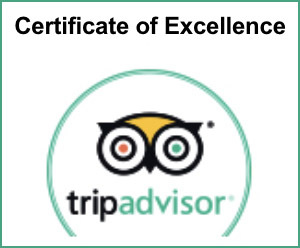 To top it off, there is no special venue to enjoy local cuisine; eat at the beachfront, a restaurant, in your private villa or simply in the midst of Saint Lucia’s friendly locals. When visiting Saint Lucia there is never ‘Too much Green’. The lush green rainforest and the diversity of plants, trees and herbs make up the unspoilt vegetation of Saint Lucia . From medication to body cleansers, Saint Lucia is known for its great use of locally grown plants as healing agents and for medicinal properties. Explore and take a fresh walk through one of Saint Lucia’s most rejuvenating forests, where nature welcomes you with the sounds of chirping birds and cool winds. Choose from sky rides, hiking or a cycle adventure, fun ways of exploring and vacationing in Saint Lucia. 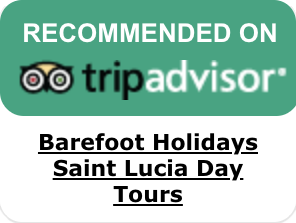 Now that you have an insight of what Barefoot Holiday’s Top things to do in Saint Lucia, planning your trip should surely be a lot easier!